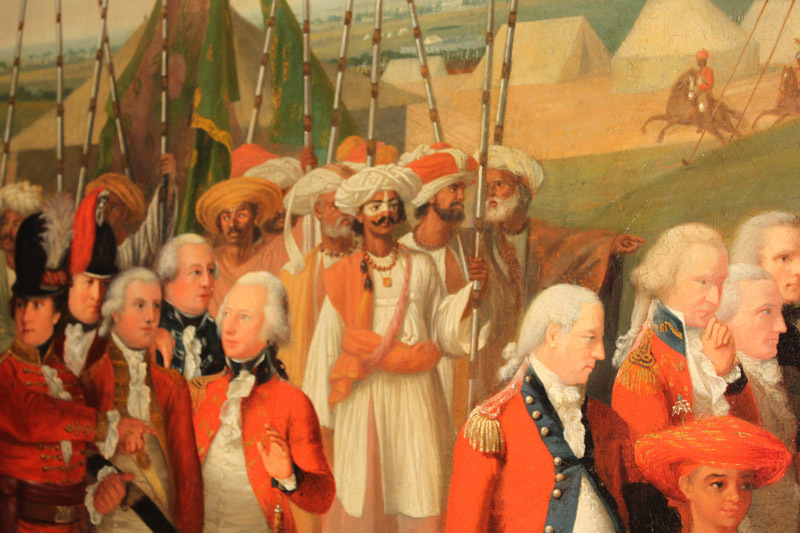 The visual narrative was used by both sides – Mysore and British to put their point of view across. It was well known that towards the end of the 1780s, 1 out of 7 British were in Mysore’s prisons as prisoners of war of the first 2 Mysore wars that proved disastrous for the English. Here was an army that with not more than 750 English soldiers and 2000 native sepoys under Clive had vanquished the 50000 men strong army of Bengal under Sirajuddaulah. And 30 years later this army was being beaten repeatedly at battle by Indians better trained and better armed than them. I have already written about Tipu using painting and wall murals as propaganda on behalf of Mysore. At the end of the third Mysore War the British exacted harsh terms from Tipu: the loss of nearly half his territory, payment of a large reparation, and the surrender of two of his sons Abdul Khalik and Moiz-Ud-Din, as hostages. They were delivered to Lord Cornwallis at Seringapatam on 26 February 1792. This event led to a lot of jubilation in the British press and kindled an interest in the public there to know about what was happening far away in Mysore. Robert Home was born in Hull, the son of an army surgeon from Greenlaw in Berwickshire. A professional artist, he had trained under Angelica Kauffman, and worked in Italy (1773-78) and Dublin (1783-89) before leaving for India in 1790 as official war artist to Lord Cornwallis in the Third Mysore War. He arrived in Madras in January 1791, at the same time as Cornwallis, the successor to General Medows as Governal General. On 5th February, the Grand Army moved towards Bangalore, and Home was permitted to follow them. 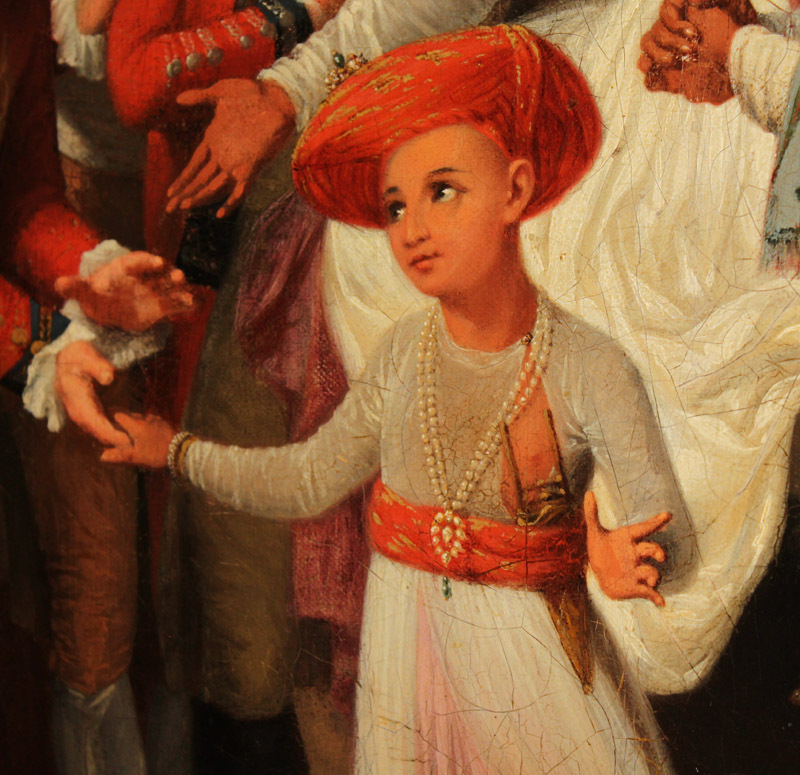 After the Treaty of 1792, Robert Home painted the splendid ‘Lord Cornwallis Receiving Tipu Sahib’s Sons as Hostages at Seringapatam, 1793-94, which has remained one of the icons of the Mysore Wars. 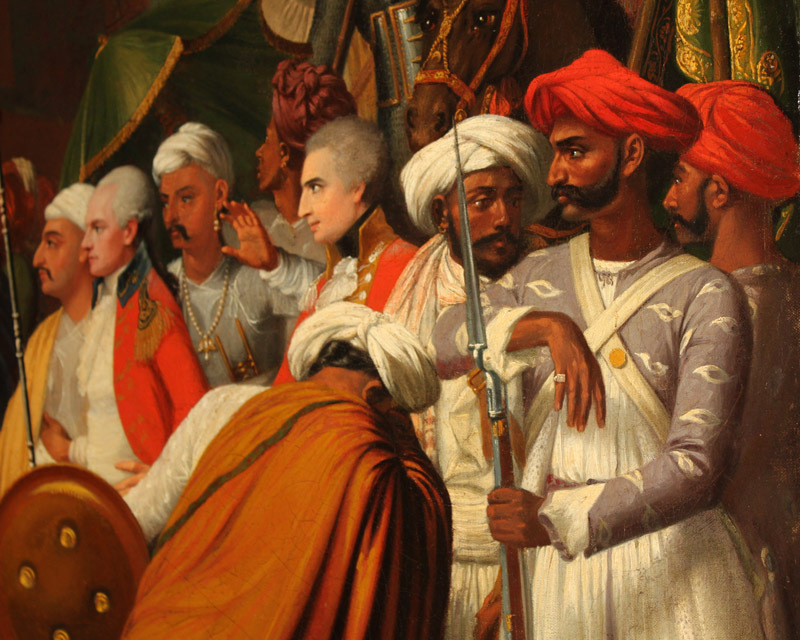 I will now use this painting which is at the National Army Museum in Chelsea, London to tell you more about Tipu Sultan, his people and the court around him. In the days preceding this event Tipu had fought with himself into agreeing to the surrender terms of the British. Having no other option after being hemmed in by the grand army of the British, Nizam and the Marathas he would have watched in desperation as his children were led out of the fort as hostages to the British. Dirom writes of two separate gun salutes in honor of the Princes, one from Tipu’s battery in the fort and the other from the British encampment in Ganjam, the Cypress garden where Tipu’s father, Hyder Ali lay buried. They were provided with a guard of honour inside the British lines and were conducted by their vakeels. A vakeel is a Hindustani term for ‘agent or lawyer’. The vakeels sent by Tipu along with his children would have been the ones whom Tipu trusted the most to ensure the safety of the princes as well as to carry on negotiations with the British. We know their names from the account of this day passed on to us by other writers to be Ghulam Ali Khan, Ali Raza and Singayya Naik. Ghulam Ali Khan was a seasoned diplomat who was the leader of the Mysorean embassy to Turkey and from there on to France and England in 1785 – 1786. He was lame on account of sciatica and a letter from Tipu exists where he sends some oil to apply onto Ghulam Ali’s legs. Even in today’s Mysore, Ghulam Ali is called ‘Langda Ghulam Ali’ or ‘The lame Ghulam Ali’. Ali Raza was again another of Tipu’s notables who was pensioned off by the British after Tipu’s demise in 1799. Singayya Naik was another of Tipu’s confidantes who we see as recently as a week before the hostage handover assisting Mir Moinudeen as his deputy in checking the English advance at Periapatnam. As we read, the hostages are lodged in tents sent out from Mysore just outside the fort where they are received by the British. I will talk about the British later but let us tarry a while within these tents. 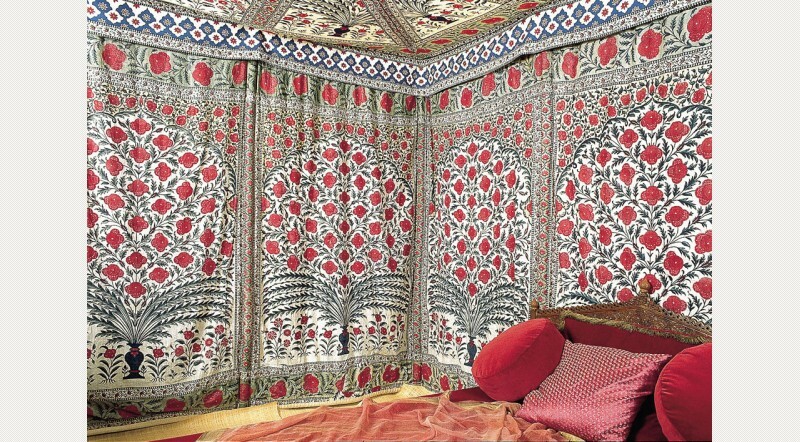 Tipu’s introduction of Silk into Mysore and encouragement of weavers from Saurashtra to settle in Mysore meant that his court churned out some of the finest textiles in India. Dirom continues his narrative— ‘The Princes were each mounted on an elephant richly caparisoned, and seated in a silver howder (sic), and were attended by their father’s vakeels, and the persons already mentioned, also on elephants. The procession was led by several camel harcarras, and seven standard-bearers, carrying small green flags suspended from rockets, followed by one hundred pikemen, with spears inlaid with silver. Their guard of two hundred Sepoys, and a party of horse, brought up the rear. In this order they approached head quarters, where the battalion of Bengal Sepoys, commanded by Captain Welch, appointed for their guard, formed a street to receive them.’ Now, why do we still see elephants in Tipu’s army as late as 1792? The reality is that though by that time elephants were not a part of actual war, they still served the part of draught animal is both the Mysorean and British armies. Dennys Forrest writes of elephants hauling heavy cannon when Tipu descended through the Satyamangalam ghats from Mysore into Coimbatore. In fact the use of elephants to haul heavy artillery continued in parts of central India till late in the 19th century. 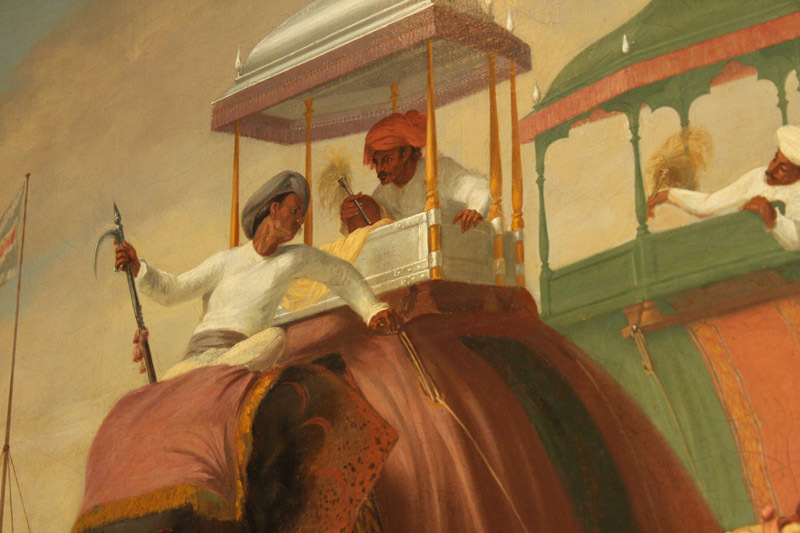 Though the British were never comfortable with riding elephants, Indian royalty still preferred their use. And this is why we see the two young princes riding to meet Lord Cornwallis seated in Silver howdahs on elephants. Tipu’s elephant howdahs were exquisite and so much valued that in the list of presents carried by Tipu’s diplomatic mission to Istanbul and France, 4 elephants and 3 silver howdahs were prominent. Unfortunately none of the elephants survived the long journey and the howdahs were lost when the ship carrying them sunk during a storm at Basra. Dirom also speaks of the procession being led by several camel harcarras, and seven standard-bearers, carrying small green flags suspended from rockets. ‘Harcarras’ were the ‘runners’ of the time, men usually on fast steeds or camels who would ferry messages from one part of the country to another. The mention of rockets is very important here because it was during the Mysore wars that the western world was introduced to the efficiency of rockets in warfare. Tipu had several ‘cushoons’ or regiments of rocket-men in his army and British accounts of the confusion and destruction rained down upon them by these rocket regiments can still be read. Arthur Wellesley almost lost his life and definitely his prestige that was only recovered at Waterloo, after an encounter with Tipu’s rocket men during the closing days of the 4th Mysore war in Malavelly near Seringapatam. Tipu’s rocketman. Observe the firing end of the rocket at his side. 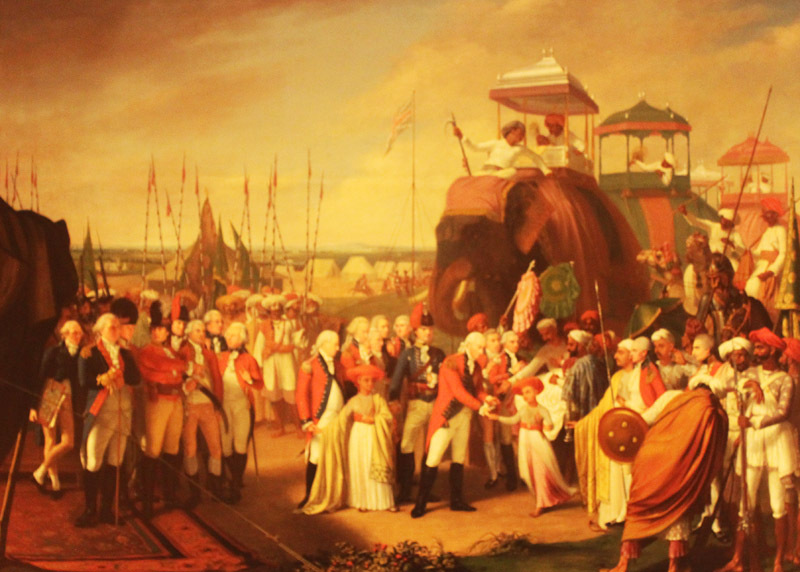 Here we see Lord Cornwallis, victor of the 1792 campaign against Mysore receiving the younger of the Princes, Moizuddin while the elder of the Princes, Abdul Khaliq stands at a distance in the care of Sir John Kennaway. 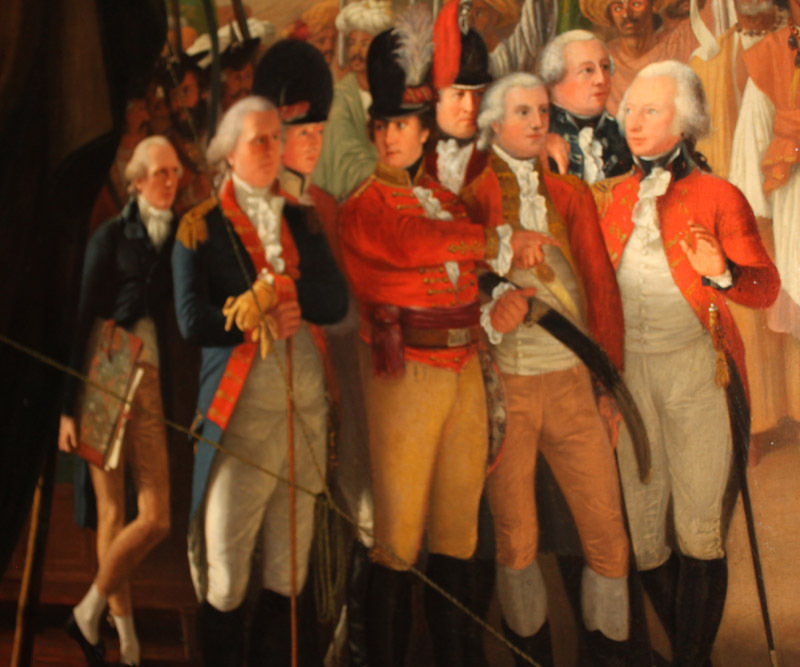 The 3rd Mysore war changed Lord Cornwallis’s fortune, still smarting as he was from the beating his American cousins had given him at Yorktown. Ghulam Ali is seen seated on a silver palanquin, more as a result of his handicap than just his exalted position. 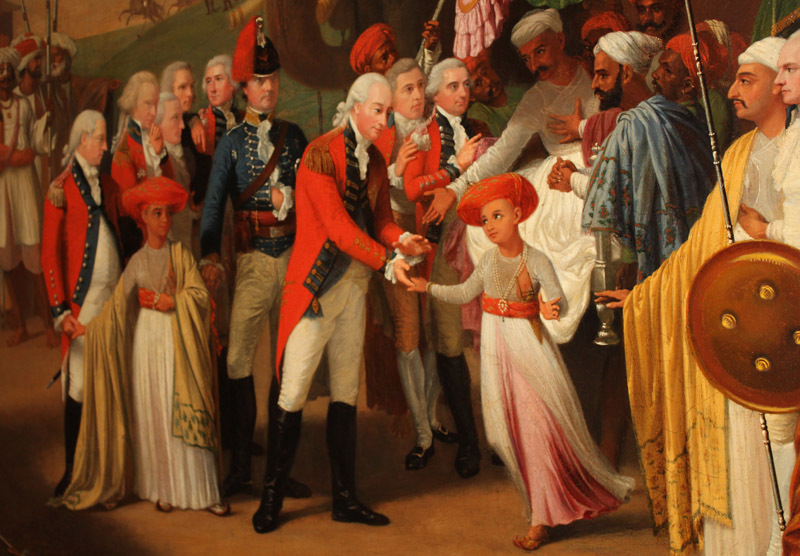 Observe Lord Cornwallis seen receiving the young Prince, holding the child’s palm and reinforcing the image of the British in India as a ‘loving paternal force’. Home through his work conveyed the impression that ‘Victory was not just of British arms alone, but also of British humanity’. The Princes were dressed in long white muslin gowns, and red turbans. They had several rows of large pearls round their necks, from which was suspended an ornament consisting of a ruby and an emerald of considerable size, surrounded by large brilliants; and in their turbans, each had a sprig of rich pearls. I have written more about jewellery from Seringapatam here. 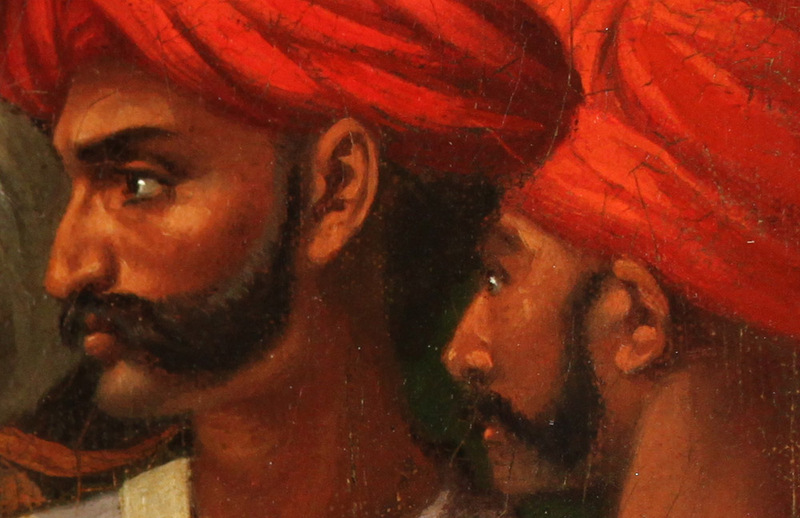 Immediately after their surrender, the hostage princes were sent to Madras, pausing en route to visit their great grandfather – Fatheh Mohammed’s tomb at Kolar, and arriving at Madras on 29th June 1792. Tipu’s sons were well looked after at Madras, where Col. Doveton was their kindly guardian. They attended a performance of Handel’s ‘Judas Maccabeus,’ and amateur dramatic performances, and on 5th July 1792, Lady Oakley, wife of the Governor of Madras, organised an entertainment with dancing. So this brings us to the end of my walkaround of this incident, but I will not stop here without introducing you to some of the the other characters in the portrait. Closeup of the Royal guard. Tipu’s Tiger Men. Here, I would like you to observe the man holding a firearm with a bayonet at the right end of the picture. He is someone who for 30 years put the fear of Mysorean arms into every English heart from Calacutta to the Carnatic. He is seen wearing a ‘tiger striped’ shirt with the typical ‘bubri’ marks on it. Tipu identified himself with the strength and ferocity of the Tiger and his factories had the exclusive license to manfacture cloth spun with the tiger stripe design. A specific order from him to his taluqdars, preserved in the Hyderabad archives, asks that 300 pieces of bubri striped cloth called ‘thaan bubri reshmin’ be sent each year to the royal presence without delay or excuse. Tipu’s tiger soldier is also seen holding on to a firearm, most probably a flintlock manufactured in Mysore. The quality of weaponry manufactured in Mysore was second to none in India and even matched the quality of European arms. 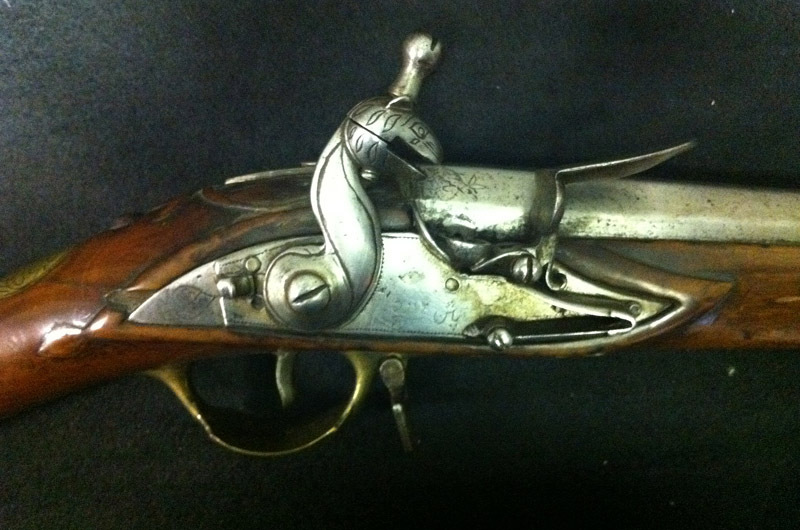 Shown below is a blunderbuss from Mysore in the reign of Tipu Sultan. The musket is also seen with a bayonet and the tiger troops carried bayonets designed with Mysore steel and in the Mysore style. 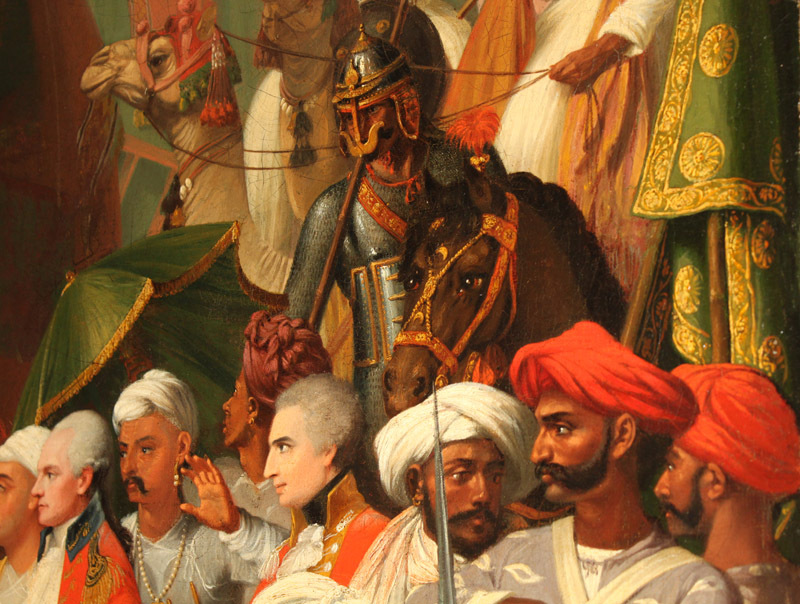 Just behind the soldier is another of Tipu’s armymen mounted on a horse and clad in armour. This kind of body armour was outdated by the end of the 18th Century even though we such see a few pieces used at Seringapatam then. The reason for body armour no longer being popular was simple – firearms had begun to replace traditional edged arms like swords, spears and arrows on the Indian battlefield. This was even more the case in a technology driven state like Tipu’s Mysore. The horseman’s war helmet is striking as Tipu owned a beautiful helmet in a style similar to this but clad in cloth typically called a ‘Peta’. 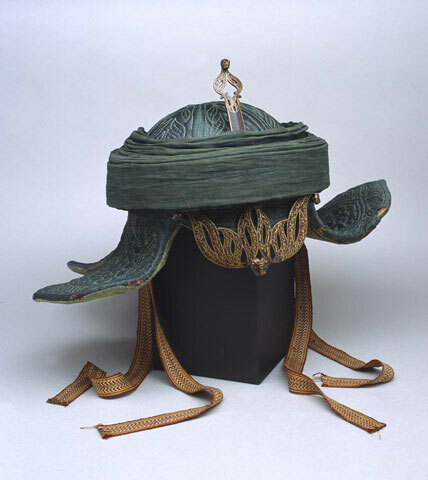 We can observe Tipu Sultan’s war helmet, now in the National Army Museum in London. Note the bubri shaped nasal guards. Standing at the back and to the left of the group can be seen Maratha soldiery keenly observing the fruits of their success. The Marathas along with the Nizam never reconciled themselves with Mysore’s growing power and inspite of Tipu’s several entreaties to them to unite together against the British never realised that the British were not in India merely to trade but were intent on giving themselves an Empire. And lastly before I finish, allow me to introduce you to Mr. Robert Home himself. He is seen in the left foreground of the portrait, standing with legs crossed and holding a portfolio. Very cleverly done, Mr. Home ! Thank you for the tour and your time. An engineer, history buff, collector of South Indian antiques. This entry was posted in Tipu Sultan & his times. Bookmark the permalink. The painter Robert Home did a fantastic job. But not as fantastic as your post here! 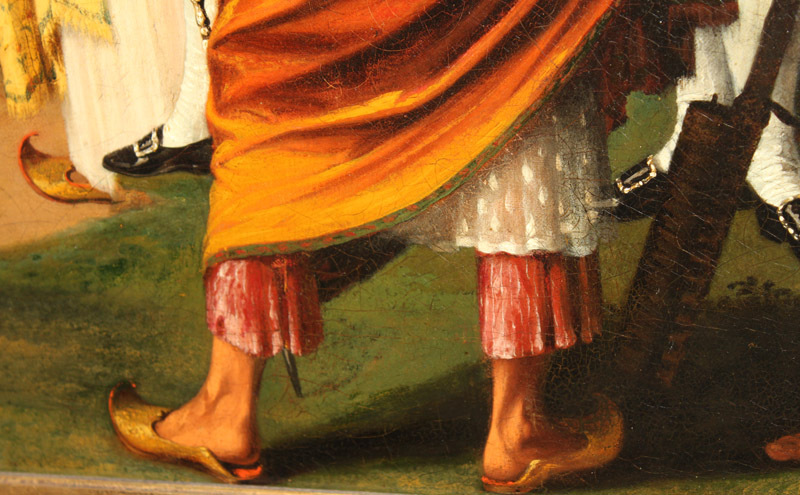 The inset photographs of the painting are in amazing detail. Kudos to Brian Isaac and Jens Nordlunde. Some more pictures of the Tiger Soldier in FULL LENGTH would be awesome. Would it be possible for you to get them Nidhin? God-willing, we’l do something about it! Wow, thank you for another brilliant and interesting post. I wonder what was going on in the mind of the Mysore infantryman holding that musket at that moment. Nidhin, do you have anything to share about the publication known as the ‘Fauji Akhbar’, said to have been started by Tipu Sultan in the 1790s? Have any copies survived? This is the best photograph I have of the soldier from this particular portrait. Thank you for stopping by and appealing to our people in Mysore and Bangalore. Thank you. Yes, I have read about the fauji Akhbar. Tipu’s factories also churned out paper, made out of wood. Some of the paper was exclusively retained for royal use and was exquisite. It had the bubri watermark!! Watermark, not just a print. I am yet to come across a copy of the Akhbar but am sure that one may exist somewhere in some dingy museum reserve. Let’s keep our fingers crossed. Thanks for this info, Nidhin. Indeed, lets keep our fingers crossed. Also, I suppose you have come across the book ‘Select Letters of Tippoo Sultan to Various Public Functionaries’? It is a pretty fascinating read. Yes Waseem, I have a copy of Kirkpatrick’s translation. Though ‘selective’, the letters are yet, interesting. Stunning commentary on the painting Nidhin, well done. Do you know of any accounts relating to the accuracy and efficiency of the ‘Rocket Men’? Thank you for stoppping by. While the rockets were not very accurate, their effect was quite disastrous on the opposing enemy as they were fired enmasse at concentrated troop formations. Imagine the effect on your morale when you see streaks of fire tied to bamboo poles 10-15 feet long come swirling at you and your horse before bursting into flames and metal splinters at your feet. Contemporary accounts refer to their range being upto 1000 yards. However later tests showed them going further to 1 – 2 kms. seem to be accurate then. I’m indebted to you my friend. I’m a Mysorean who can trace his lineage much past the Mysore sultanat. This article you have here is an excellent piece of work. It is saddening to note that the contributions and legend of the great Sultan is undermined and mired in undue controversies for petty gains by various entities in today’s India. If you need much material for your research you can get in touch with the seminary Dar-ul-Umoor located in seringapatam. There is so much to our rich history from the tunnel networks across Mysore-Bangalore to the Rocket artillery armoury, to the Palaces razed by the British during the invasion, the Sultan’s pet Tigers, the death of the traitor Moinuddin, tons of truth to be unfurled and told, to be heard. I wish you all the very best mate. In the name of the one King who made his mark in the annals of history as the bravest of the brave. The most formidable foe the British ever faced. To Sultan Fateh Ali Tipu!!! Thank you, mate! God bless you too. Just back from a trip to srirangapatnam and mysore and came across your blog..awesome research n well written articles. Keep up the good work.